1) Lay the CFW cover plate down flat as shown in figure 1. 2) Lay the AO-7 housing on the cover plate so that the 2" holes are aligned. 3) The first two holes you will drill will be through the CFW cover plate using the lower two holes (1) and (3) of the AO-7 housing as a guide. 4) Use a sharp punch or something that can go through the lower pre-existing hole (1) to mark the CFW cover plate for where a hole should be drilled. 5) Drill out the hole that you just marked. 6) Secure the AO-7 housing to the CFW cover plate with a screw through the hole (1) and a nut (2). 7) With the AO-7 housing secured to the CFW cover plate it should now be easy to drill out the second lower hole (3). 8) Insert another screw (3) and nut (4) for this second hole you just drilled. 9) The next two holes you drill will be through the AO-7 housing using the top two holes (5) and (6) of the CFW cover plate as a guide. 10) Now flip the assembly over and drill through the AO-7 housing using the two pre-existing holes (5) and (6) in the CFW cover plate. 11) Clean the assembly well to make sure you remove any metal shaving left over from drilling. 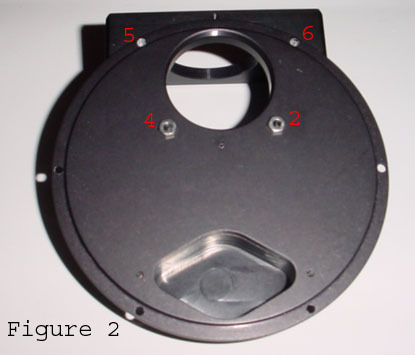 12) Lay the CFW cover plate with AO-7 attached onto the CFW filter wheel assembly. 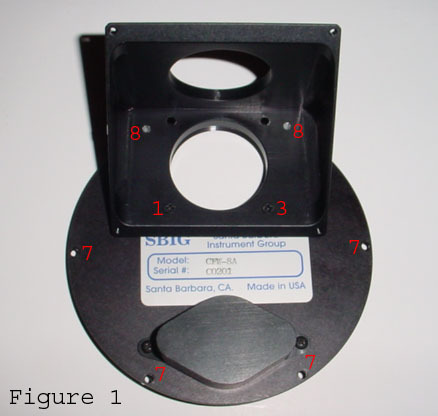 13) Attach the CFW cover plate using the original screws at the locations marked above (7). 14) Use longer screws to secure the cover plate through the top two holes that go through the AO-7 housing (8). 15) You can now reattach the AO-7 mirror housing and your ready to go with a flush connection.